"Wine is bottled poetry" (Robert Louis Stevenson, 1850 - 1894) - a sentiment that comes to life in the Cape Winelands, a region just outside Cape Town featuring magnificent natural beauty, rich cultural heritage and world-renowned wines. The highlights are centered around Stellenbosch, Paarl and Franschhoek, where the Mediterranean climate and winter rainfall create ideal conditions for the production of world class wines. The Winelands make a fabulously romantic stop on a honeymoon safari, especially for vinophiles who can enjoy tastings at over 200 cellars. Since the town was founded in 1679 by the Dutch, Stellenbosch has been at the forefront of South African wine-making. Fertile, well drained soils, an optimal climate, and more than three centuries of experience with viticulture combine to produce some of South Africa's best wines. Stellenbosch itself is a quaint university town, with old churchyards and well-maintained gabled buildings along oak lined streets. 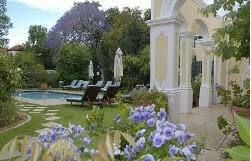 Accommodation: River Manor is a boutique hotel that nestles quietly under Stellenbosch's ancient oaks beside the Eerste River, just 2 minute's walk from the town's historic center. The in-house Gingko Spa offers a full range of therapies and treatments. There are two patios and two swimming pools with mountain views. 18 rooms. It was in 1694 that Dutch authorities granted the first farms to French Huguenots in the area that was to become known as Franschhoek, and their influence can still be seen and felt today. Franschhoek has become a center of gastronomic excellence, showcasing award winning restaurants and fine wines. The picturesque main street is lined with antique shops and galleries. This year Le Quartier Francais turns 20 and, to celebrate, is offering some special packages (please contact us for details). The accommodation is lovely, but what really sets this hotel apart are the culinary delights presented by Grand Chef Margot Janse. For the fifth consecutive year The Tasting Room was included in the S.Pellegrino World's 50 Best Restaurants, winning the category Best Restaurant in Africa and the Middle East, and placing 37th overall. Also on offer are cooking classes. 17 rooms. Restaurants: The Tasting Room at Le Quartier Francais, La Petite Ferme, French Connection, Haute Cabriere. Paarl began as a farming and wagon-building settlement in 1720 and was named after the granite rock overlooking the town that resembles a giant pearl. 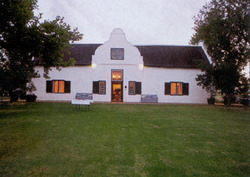 The Paarl Discovery Wine Route includes whitewashed Cape Dutch estates such as Vendome and Laborie. The route also includes Zandwijk, the Cape's largest producer of kosher wines, several worthy empowerment initiatives and added attractions such as Venetian-style glass blowing at Seidelberg. An eighteenth-century Cape Dutch masterpiece, the farmhouse of Roggeland is a national monument, featuring a variety of original features, exposed Yellowood beams and reed ceilings, thatch, antique furniture and art. Roggeland Country House boasts an ideal country setting with spectacular vistas of majestic mountains. 10 rooms. Restaurants: Bosman's at the Grande Roche, Marc's, The Goatshed.